To make the cupcakes: Preheat the oven to 350 degrees F. Line cupcake pans with paper liners. 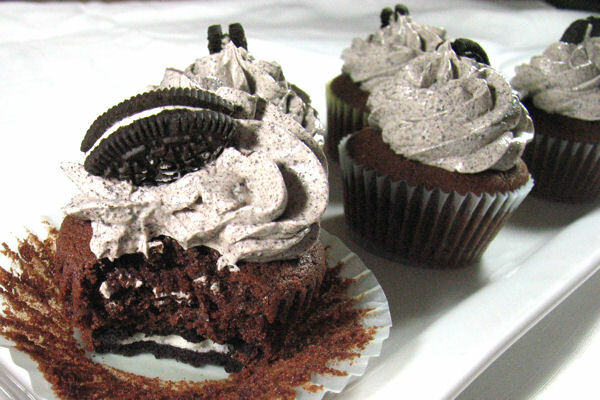 Place an Oreo in the bottom of each cupcake liner. In a small bowl, whisk together the cocoa powder and hot water until smooth; set aside and let cool slightly. In a medium bowl, whisk together the flour, baking soda, baking powder, and salt; set aside. In the bowl of a stand mixer fitted with the paddle attachment, combine the butter and sugar. Beat together on medium-high speed until light and fluffy, about 3 minutes. Mix in the eggs one at a time, beating well after each addition and scraping down the sides of the bowl as needed. Slowly mix in the vanilla extract then the cocoa mixture, beating until incorporated. With the mixer on low speed, add the dry ingredients in two batches, alternating with the sour cream, beating until just combined. Divide the batter between the prepared cupcake liners, filling them about ¾ of the way full. Bake 18 to 20 minutes, or until a toothpick inserted in the center comes out clean. Allow the cupcakes to cool in the pan 5 to 10 minutes, then transfer to a wire rack to cool completely. 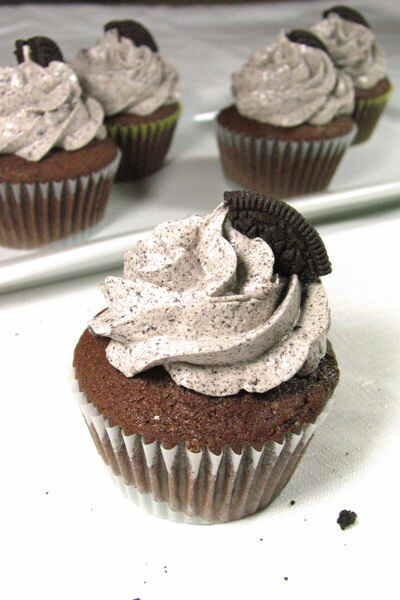 To make the Oreo buttercream: In the work bowl of a food processor attached with the steel blade, blend the Oreo cookies until fine crumbs form; set aside. Set a heatproof mixing bowl over a saucepan of simmering water. Combine the egg whites and sugar in the bowl. Cook, whisking constantly, until the mixture reaches 140 degrees F, or all sugar is dissolved and mixture is hot to the touch. Using a stand mixer fitted with the whisk attachment, beat on low speed for 2 minutes, gradually increasing to high speed. Beat until stiff peaks form and mixing bowl is cool to the touch. With the mixer on medium-low speed, gradually add a couple tablespoons of butter at a time, beating well after each addition. Continue beating on medium-high speed until thick and smooth. Add the Oreo crumbs and beat until fully incorporated. Switch to the paddle attachment and beat on low speed for 2 minutes to eliminate air bubbles. Spoon frosting into pastry bag fittind with large decorating tip. Frost cooled cupcakes as desired. Preheat the oven to 350 degrees F. Grease an 8-inch square baking pan and create a foil sling: tear off 2, 16-inch long pieces of aluminum foil and fold them in half. Lay one in the center of the pan, flattening it along the bottom and sides of the pan and leaving overhanging flaps on each side. Situate the other foil piece in the same manner, but perpendicular to the first foil piece. Grease the foil; set pan aside. In a small bowl, whisk together the flour, cookie crumbs, baking powder, and salt; set aside. Cream the butter and sugar together in a large bowl until fluffy and pale yellow, about 3 minutes. Beat in the egg and vanilla. Gradually add the dry ingredients and mix until just combined. Divide the dough roughly in half, placing half the dough in your prepared pan. Use your fingers or a rubber spatula to press and spread the dough in the pan until it covers the bottom in an even layer. Place the candy bars side by side over the dough; if they don’t fit, break and arrange them so you have a full single layer of chocolate (about ¼-inch thick). Drop dollops of marshmallow crème on the chocolate and use a rubber spatula to spread it evenly. Take the remaining dough and place on top of the marshmallow layer; easiest method is to take a small handful at a time and flatten it into a “shingle” then lay them together until the top is covered. Bake for 25 to 30 minutes, or until lightly browned. Let cool completely in pan before gently using the overhang of the foil sling to lift the bars out of the pan and place them on a cutting board. Slice into 9, 12, or 16 bars, depending on desired size. Store in an airtight container. A few days ago it was one of my coworker/friend’s birhdays. I like to make them little treats for their birthday, because everyone loves some pie or cupcakes for their birthday! And I love an excuse to make something special. 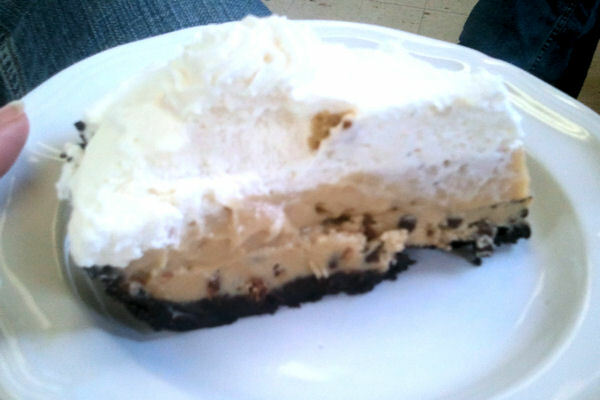 This pie… special indeed! I came across it during my random blog browsing and knew I would have to try this. With my friend’s birthday coming up, I knew I would have a chance to make it. She loves cookie dough more than I do, and that’s saying something! 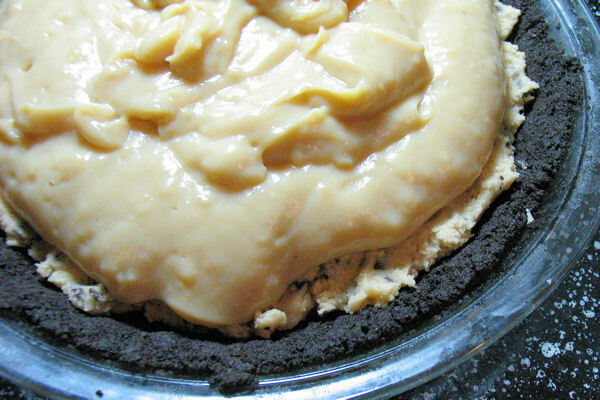 With this delicious pie, there is an Oreo crust layered with eggless cookie dough. There will be extra dough, but it’s eggless so feel free to snack! Or make them into little balls and dip them in chocolate, and you have cookie dough truffles. 🙂 Next we have a brown sugar custard, kind of like cookie dough but in custard form! 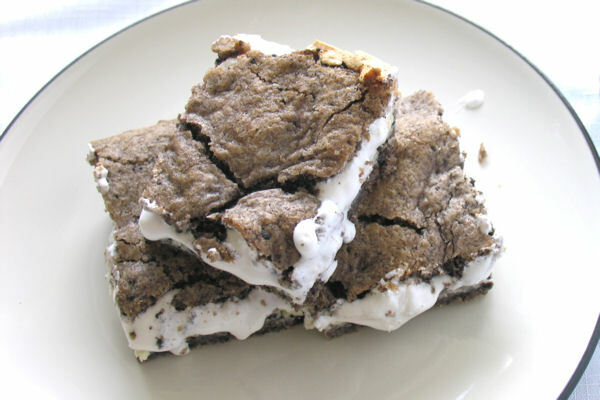 It’s all topped off with light and fluffy whipped cream and extra cookies just for fun. Now, just pretend this next picture actually came out well… I took the picture at work with my cell phone, and I apparently don’t know how to take up close pictures with my phone. So please, pretend it’s not all blurry! I just wanted to share all the pretty layers! 🙂 In conclusion, if you love cookie dough, you’ll love this pie! 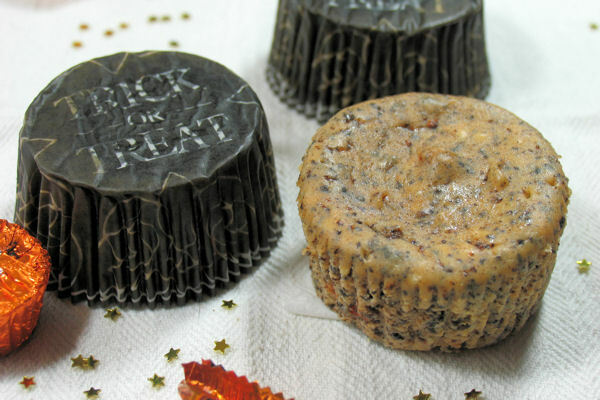 It’s so unique and so fun, so give it a try next time you want a tasty treat! To make the crust: Preheat the oven to 350 degrees F with the rack in center position. Place the crumbled cookies in the work bowl of a food processor fitted with a metal blade. Pulse until the cookies are finely ground. Drizzle the butter over the crumbs and pulse until the butter is evenly distributed and the crumbs are coated. Pour the crumbs into a 9-inch pie pan. Press the crumbs evenly along the bottom and up the sides of the pan. Bake for 8 to 10 minutes. Remove pie pan and cool on a wire rack; crust will firm up as it cools. To make the filling: In a medium saucepan over medium-low heat, combine the milk, sugar, and salt. Heat until sugar is melted and milk barely simmers. In the meantime, whisk together the egg yolks and cornstarch. Gradually whisk the heated milk mixture into the egg yolk mixture. Transfer the mixture back into the saucepan and set it over medium heat. Whisk constantly, scraping the bottom and sides to prevent burning, until the mixture thickens and is the consistency of pudding. Remove from the heat and stir in the vanilla and butter. Set aside to cool to room temperature. To make the cookie dough: While the filling is cooling, prepare the cookie dough. Combine the butter and sugars in a mixing bowl and beat on medium-high speed until light and fluffy, about 2 minutes. Beat in the milk and vanilla; slowly beat in the flour and baking soda until fully combined and smooth. Stir in the chocolate chips. 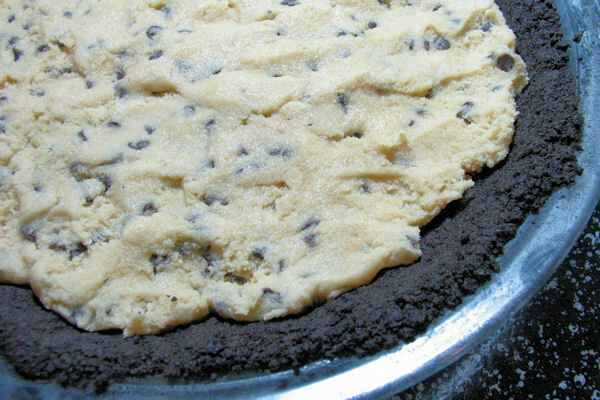 To assemble: Break off pieces of cookie dough and press them into the cooled pie crust until the dough layer is about ½-inch thick (there will be dough left over). Pour filling on top of dough layer, leveling the top with a rubber spatula. Refrigerate until completely cooled. To make the whipped cream: Right before serving, in the bowl of a stand mixer fitted with the whisk attachment, whip the cream until soft peaks form. Add sugar and vanilla and beat until the cream holds stiff peaks. Spread the whipped cream on top of the filling, reserving about ⅓ cup to decorate. 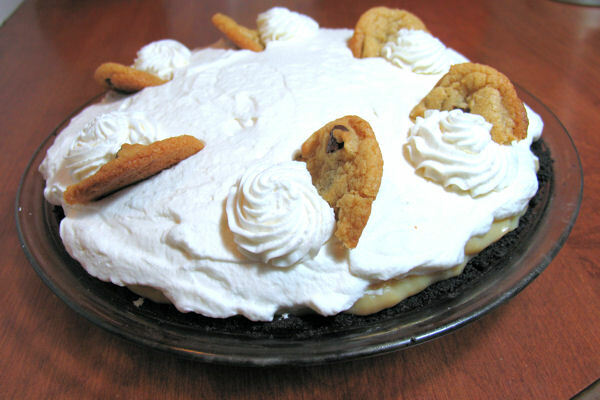 Pipe or dollop the whipped cream evenly around the pie, and garnish with mini chocolate chip cookies, if desired. I love Halloween! It’s one of my favorite holidays! I know it’s almost too late to be posting Halloween stuff, but I still have time! These are quick and easy. They’re also supposed to be a brighter orange… so don’t be like me and think that the color will darken up when they bake 🙂 Or I guess you could pretend they’re mini pumpkin cheesecakes! Those would be awesome, too, but that’s not what these are unfortunately. Hehe. But I still wanted to post something festive, and I love my cupcake liners! I bought these black trick-or-treat ones and also some orange ones with black bats. Now I just need to get baking so I can actually use them before it’s too late… But anyways, just imagine these in a nice, bright orange and they’re totally festive! So Happy Halloween, a little early!! Is anyone dressing up? Preheat oven to 275 degrees F. Line a cupcake pan with cupcake liners. 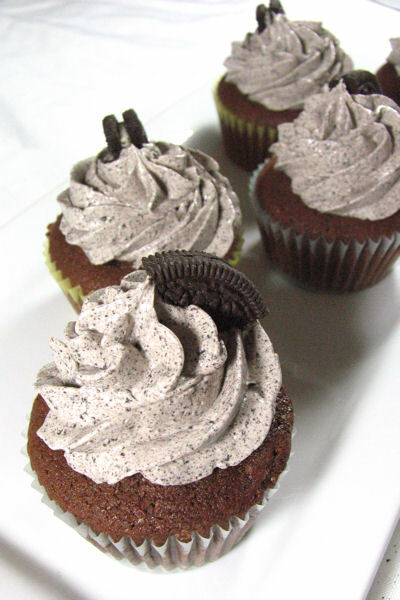 Take 15 Oreos and put 1 in each cupcake liner. Place the other 6 in a food processor and grind them up until they are crumbs. Alternatively, put them in a plastic bag and crush them. Set aside. In a bowl of a stand mixer with the paddle attachment, mix the cream cheese on medium speed until smooth. Add in the sugar, sour cream, and vanilla extract and mix until combined. Slowly add in the lightly beaten eggs and mix until just combined; do not over mix. Add in a small amount of orange gel food coloring and stir with a spatula until desired color is achieved and the entire cheesecake batter is colored. Stir in the Oreo crumbs. 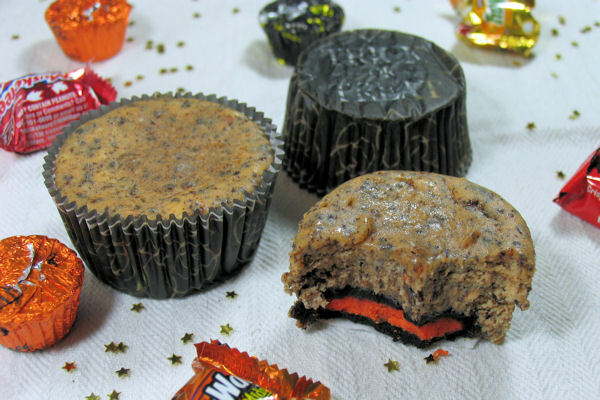 Using an ice cream scooper, fill each cupcake liner with the cheesecake batter, almost to the top. Bake for 22 minutes. Halfway through the baking time, rotate the pan. Once the cheesecakes are done baking, chill them in the cupcake pan in the refrigerator overnight. I have a lot of recipes bookmarked. Such is the life of a blogger and a foodie! I never really had a good way to organize all these bookmarks until I came across Delicious. Its an online database where you can store your bookmarks and organize them with tags. You can even browse other people’s bookmarks based on their tags and explore the most popular bookmarks on the web. It’s a fun website and a great way to organize what was otherwise just a long list with no structure or order. When organizing my bookmarks, I realized I had bookmarked this recipe not once, and not twice, but three times!!! From three different sites! Apparently, I reallllly thought this recipe looked good since it looked amazing every time I saw it! 🙂 So, I finally made it, and it was awesome. Note: Can be doubled and made in a 13×9-inch baking pan. 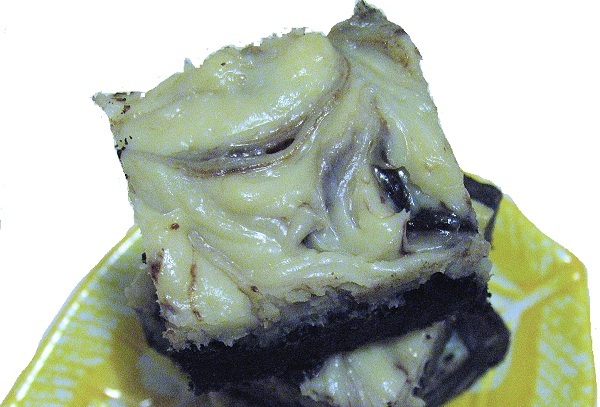 Preheat oven to 350 degrees F. Line an 8×8-inch square baking dish with foil; coat foil with cooking spray. Melt the butter in a small saucepan, over medium heat. Whisk in sugar and bring to a boil, whisking frequently; boil 1 minute. Set aside to cool. Once cooled enough, add the eggs and whisk to combine. In the meantime, in a medium sized mixing bowl, whisk together the flour, cocoa powder and salt. Stir in the Oreo cookies. Add the sugar-butter-egg mixture and stir until just combined. To make the cream cheese mixture, combine the cream cheese, confectioners’ sugar, and vanilla extract in a small mixing bowl. Beat with an electric mixer until well combined, about 1 minute. 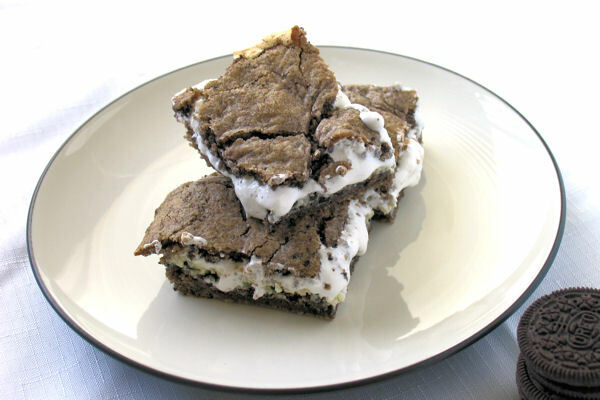 To assemble, spread three-quarters of the brownie batter into the baking dish, then spread the cream cheese mixture on top; dot the cream cheese layer with the remaining brownie batter. 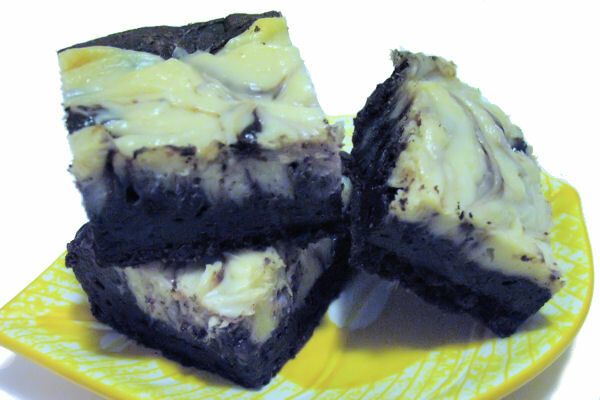 Use the blade of a knife to gently swirl the brownie batter into the cream cheese mixture, creating a marbled effect. Bake at 350 degrees F, for 23-25 minutes. Cool on a wire rack to room temperature before slicing. Lift foil out of baking dish, and slice into 9 bars. For easier slicing, try refrigerating or freezing the brownies for 30-60 minutes.